Last week we discussed your oral health and the impact it has on your overall health (here). For some, this may have been an awakening or call to action to take their oral health more seriously. Today, we’ll talk about two factors that can help begin reversing oral neglect, along with making an appointment for an exam with Dr. Emery and her team at Sugar Fix Dental Loft! 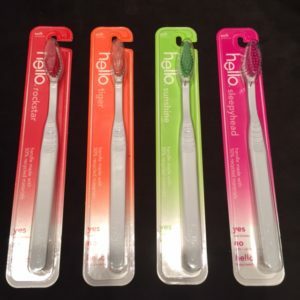 The right brush can help fight plaque and decay! Teeth have a protective layer of enamel but they are far from invincible. Without proper care, our oral health can quickly suffer and begin to deteriorate. After each meal, bacteria in the mouth feeds on biofilm. Biofilm is a think layer of food particles (plaque) that sticks to teeth. After ingestion, this bacteria produces acid, which erodes your teeth’s protective layer of enamel and leads to tooth decay. While saliva naturally neutralizes high levels of the acid the bacteria produces, saliva can be overwhelmed. If your mouth is chronically acidic, saliva can’t work fast enough to restore some of the enamel’s mineral content lost. You should floss and brush with fluoride toothpaste everyday to remove plaque. It’s also recommended that you visit us twice a year for professional cleanings to remove hard to reach plaque. We can also train you on how to properly floss and brush. Wait an hour after eating to brush. It may sound counterintuitive, but brushing immediately after you eat can do more harm than good. The mouth is naturally acidic just after eating and some degree of enamel softening usually occurs. It takes a half hour or so for saliva to restore the mouth’s pH balance and re-mineralize the enamel. If you brush before then, you may brush away some of the softened enamel. Constantly snacking on sweets (or sipping sodas, sports or energy drinks) will expose your teeth to a chronic high level of acid — and saliva can’t keep up in neutralizing it. If you can’t abstain from sugar, at least limit your consumption to mealtime. It’s also a good habit to rinse out your mouth with clear water after drinking an acidic drink to flush out excess acid. Boost saliva content with supplements. If you suffer from insufficient saliva production or dry mouth, try an artificial saliva supplement. Chewing xylitol gum can also help boost saliva production, as well as inhibit the growth of infection-causing bacteria. We’ll be glad to advise you on the use of these products. If you’d like more information of protecting your teeth from tooth decay, please contact us to schedule an appointment for a consultation today!